Tonight’s lesson brought my new client up to the fourth hour of his first course on western boxing for martial arts cross training. We worked on defeating personal fight predictability and creating patterns for opponents. We warmed up line work, isolating and building upon different footwork. We did repetitions of backwards and forwards work then added on slipping, then added on slip/jabbing then added on slip/jab/crossing. The same was repeated for lateral footwork. Next, did some mirror footwork looking at circling and v-stepping (angling off). From here we performed some one-for-one slip/jabbing and slip/jab/crossing. Then we switched to ducking, bobbing and weaving to set up hooks to the head and body. We also covered the low hook/high uppercut combination. To revise some speed training, we went into the 11 punch combination. This was then combined with footwork and upper body movement. We then brought this into the wider scope of training tactics. By breaking rythms of punching and changing footwork patterns, a fighter gives himself an opportunity to surprise his opponent. Furthermore, if a fighter can manufacture a false pattern he can trick his opponent. We did this with some simple back and forth punching combinations – double jab backwards/jab cross forwards or jab/slip jab/v-step/overhand. Training finished with a round of sparring. This client has done some superb interim work. He has rigged up a tennis ball to work as a D’Amato style slip bag. This has transferred well into his head movement. For footwork, my client has been looking at some of the amazing work done by Sugar Ray Leonard. 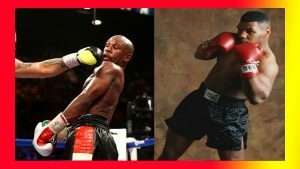 Tyson/D’Amato low hook/high uppercut & Ray Leonard’s Footwork Explained.